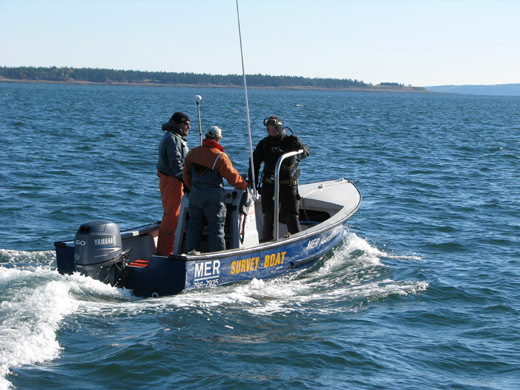 MER Assessment Corporation (MER) is a marine environmental and resource consulting company based in Brunswick, Maine. MER works with the private and public sectors to support project planning and permitting by conducting baseline environmental surveys and marine resource data collection. Once projects enter the development, construction, and operation phases MER provides project-specific monitoring services related to permit conditions and, when impacts are anticipated, develops and implements mitigation measures. MER’s capabilities include water column profiling and sampling, current measurement, quantitative and semi-quantitative underwater video recording, intertidal and subtidal marine resource assessment, marine habitat evaluation and delineation, benthic infauna community analysis, and sediment composition and chemical measurement. MER is an A-listed contractor with the Maine Department of Environmental Protection for Natural Resource Damage Assessment (NRDA). MER’s mission is to provide the highest quality marine environmental and resources consulting services as professionally, effectively, and affordably as possible.